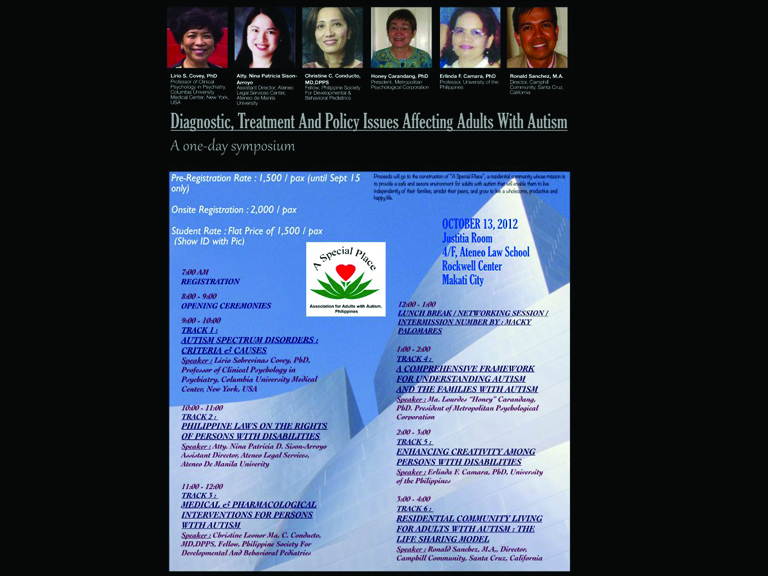 The Association for Adults with Autism, Philippines (AAAP) held a symposium entitled “Diagnostic, Treatment and Policy Issues Affecting Adults with Autism” last October 13, 2012 at Justitia Room, Ateneo Law School, Makati City. The event was the first initiative of AAAP to formally educate stakeholders on the issues and concerns affecting adults with autism and their families. The event brought experts like Atty. Nina Patricia Sison-Arroyo from the Legal Services of Ateneo de Manila University who shared on the “Philippine Laws on the Rights of Persons with Disabilities, Dr. Christine Conducto, a fellow of the Philippine Society for Developmental and Behavioral Pediatrics on “Medical and Pharmacological Interventions for Persons with Autism, Dr. Lourdes Carandang, the President of the Metropolitan Psychological Corporation on “A Comprehensive Framework for Understanding Autism and the Families with Autism”, Dr. Erlinda Camara from the University of the Philippines, Diliman on “Enhancing Creativity Among Persons with Autism”, Mr. Ronald Sanchez, the Director of the Camphill Community of Santa Cruz, California, USA on “Residential Community Living for Adults with Autism: The Life Sharing Model” and Dr. Lirio Covey, the President of AAP on “Autism Spectrum Disorder: Criteria and Causes”. The symposium provided participants with new knowledge and information on autism and the challenges of adults with autism. It also gave an opportunity to parents of persons with autism to understand the concept of a residential community living model of Camphill community in the US -- a model of an inclusive community living that can be adapted to suit the challenges of Filipinos with autism. An exhibit of the works of Vico Cham, a person with autism was shown and Macky Palomares, a student with autism and the son of the ASP Diliman QC chapter president, Josephine Palomares, played the organ as a intermission number to entertain the participants of the symposium. ASP commends initiatives that promote the rights and welfare of persons with autism and their family. ASP Chair Emeritus Dang Koe, Treasurer Evelyn Go, Auditor Grace Adviento, Executive Director Ranil Sorongon and staff Cricel Elises were in attendance in support of this milestone event.